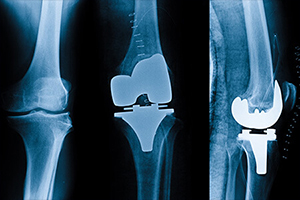 The knee is a hinge joint analogous to the hinges of the door allowing one way bending only. However it also allows some degree of twisting from side to side. It allows weight bearing and movement. 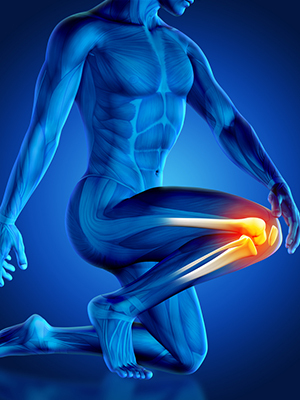 The knee is basically a construct of the thigh bone (called femur) and the shin bone (called tibia) and the knee cap (called patella).The bones are lined by a smooth layer called articular cartilage to allow smooth low-friction movement of the bearing surfaces. Between the femur and tibia are two floating cartilages called medial and lateral menisci which act as stabilisers, shock absorbers and increase the surface area of contact for stress distribution. There is a inner membrane layer called Synovium which produces fluid for lubrication and also nutrition for cartilage. The knee is stabilised by two ligaments outside the joint called the medial and lateral collateral ligaments to support the knee and avoid side-to-side abnormal movement. The knee is stabilised by two ligaments inside the joint called the ACL (anterior cruciate ligament) and PCL (posterior cruciate ligament) to prevent instability/buckling and avoid abnormal anterior/posterior transalation of the bones on each other. The muscles around the knee are secondary stabilisers. 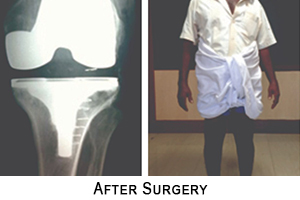 Total knee Replacement is a surgical procedure where the worn out/deformed ends of the femur (thigh bone), tibia (leg bone) and occasionally also the patella (knee cap) are reshaped using special jigs to prepare the surfaces of the bones to restority are fixed to the bones using a special substance called PMMA bone cement. The stability, range of movement and alignment of the joint are checked and ensured throughout the procedure. 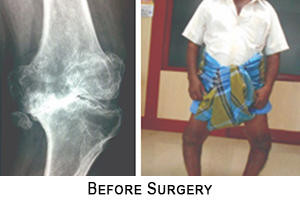 READ THE GENERAL INTRODUCTION TO JOINT REPLACEMENT SURGERY FIRST BEFORE PROCEEDING FURTHER FAQs I am 80 years old . Am I not old for surgery? The true physiological age of the patient is not of true relevance. Other factors like life expectancy, activity levels, mobility levels, cardiac/physician assessment should be considered. Most patients can walk within 24 hours after surgery. However pain tolerance, general condition, co-morbid diseases, muscle strength, degree of deformity corrected, bone strength are factors to consider. Hence some patients may walk in 48-72 hours. Patients usually climb two to five steps before discharge. This ensures that they can achieve independence when they return home and need not depend on family members for support. How long do I need hospitalisation after surgery? Patients usually stay for around five days after surgery (range of 3 to 7 days). The purpose of post-operative hospital stay is wound dressing, antibiotics, pain killers and other medications, exercises under physiotherapist guidance, training to achieve independence after surgery. There is no need for a walker usually. However a walker is advised as a temporary support for 3-4 days for pain relief and to encourage walking. The sutures usually come off by 12-14 days after surgery. Usually two dressings are done during hospital stay. After discharge one further dressing maybe needed before suture removal. All dates can be comfortably made up by prior appointments. Do I need a belt/brace after surgery? In some patients, a brace is suggested as a support for weak bones (ex. Osteoporosis, Rheumatoid arthritis). A brace can also help in pain relief initially. People I have seen still limp after surgery? There are many reasons for limping after surgery, the most common being not doing adequate exercises to restore mobility and not improving muscle strength. Other occasional causes include infection, implant loosening etc..
Do I need to meet a physiotherapist after surgery? The role of a physiotherapist is to encourage mobility, aid and assist in achieving movements of the knee, improving muscle strength and achieving independence after surgery. I have diabetes/heart disease. I am not fit for this surgery right? Invariably all individuals after 40 years of age have one disease atleast like diabetes, hypertension. Heart disease, asthma, thyroid, eosinophilia, allergy etc.. The mere presence of such diseases is definitely not a contraindication. However, since this is an elective surgery, it is better to control these co-morbid illnesses and then perform the surgery.